Through yesterday’s close, the S&P 500 is up 8.66% off its intraday lows from December, and with futures trading higher in the pre-market, we’re nearing the 10% point in terms of the equity market’s recovery. President Trump was just out with a tweet that Chinese trade talks are going very well, and while the impact of these types of tweets is not as strong as it once was, futures have gotten an extra lift. 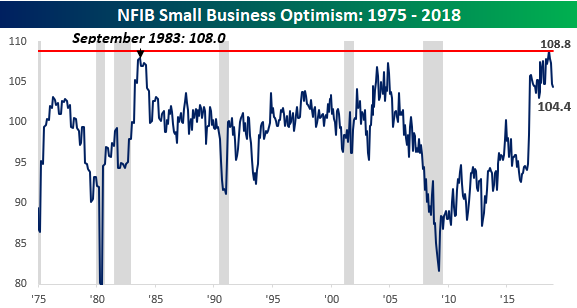 Small business sentiment for the month of December was released earlier this morning and showed a smaller than expected decline falling from 104.8 down to 104.0 versus expectations for a decline to 103.0 (more in the Morning Lineup pdf). While the decline wasn’t as large as expected, since peaking four months ago in August, small business sentiment has now dropped in each of the last four months for its largest four-month decline since December 2012. Not a trivial decline. 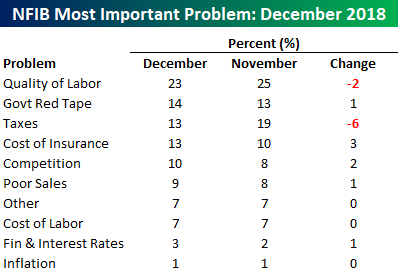 As for the issues that have been the biggest problems for small business owners, Taxes saw a large decline falling from 19% down to 13%, while Quality of Labor dropped from 25% down to 23% but is still the biggest problem. Filling in the void for those declines, Cost of Insurance saw the largest increase followed by Business Competition.